Pilot's watches are IWC's specialty. The Swiss manufacturer has been producing high-quality pilot's watches since 1936, including the classics that make up the Mark series. Currently, they offer around two dozen different pilot's watch series. The International Watch Company, also known as IWC, presented their first pilot's watch in 1936. Since then, IWC has been considered the pioneer in developing and manufacturing pilot's watches. The original watch from 1936 had a diameter of 37.5 mm, making it relatively large for its time. This special watch had a finely ridged bezel with marker needle, enabling the wearer to record short periods of time. Not all planes were equipped with a fuel indicator in the 1930s, so pilots kept track of the flight time via the watch bezel. This allowed them to monitor the flight time, fuel consumption, and cruising range. Large, light-colored Arabic numerals and a black dial define the look of this special watch. The decentralized seconds is located at six o'clock. The escapement is protected against magnetism, which can negatively impact a timepiece's precision. Many features of this original watch are still being used today. Current pilot's watches have stark color contrasts and luminous hands to make them more legible, and many have streamlined designs featuring protection against magnetism. The 52-caliber T. S. C. Big Pilot's Watch (reference number 431) followed in 1940 with an impressive 55-mm diameter case. IWC delivered this timepiece to the German Air Force. It was not the watch's size, but rather the rest of its design, that has influenced the look of classic pilot's watches to this day. Black/white dial contrast, sword hands, stick indices, Arabic numerals, and a triangle at 12 o'clock all remain typical design features of classic pilot's watches. The watch from the 1940s was succeeded by the Big Pilot. IWC has been producing this 46-mm stainless steel watch with a black dial since 2002. The watch isn't as big as its predecessors, but its new size is more practical. The 55-mm cases were meant to be worn over flight suits and weren't created for everyday civilian use. The Big Pilot has a seven-day power reserve thanks to a long mainspring and a special winding mechanism, the Pellaton winding system. It's named after its inventor, Albert Pellaton, who was the technical director at IWC for many years. In 1950, he patented this new technology whereby an automatic watch is wound bidirectionally by the natural movements of the wearer's arm. The round power reserve display is located at three o'clock. One of IWC's top pilot's watches, the Mark XVIII, has its roots in 1948. IWC introduced the simple pilot's watch Mark 11 in that year; a watch that served as the Royal Air Force's service watch for 30 years. The name "Mark" comes from the RAF as well; the British used the term to refer to all interchangeable air force equipment that came from different manufacturers. In 1981, the RAF gradually phased out the Mark 11. By that time, IWC had made 8,000 timepieces for the military and 1,500 for civilian use. In 1994, IWC presented the watch's successor and switched to using Roman numerals for the name Mark XII. The Mark XVIII, with a diameter of 40 mm and a thickness of 11 mm, has been available since 2016. Visually, it's not too different from the Mark 11. The wide sword hands, which replaced the older baton hands, immediately catch the eye. However, IWC made some concessions to keep the watch technologically up to date: The watch features a date display and an automatic movement instead of the legendary manual Caliber 89. IWC also produces the Pilot's Watch Automatic 36. It's modeled after the Mark XVIII in terms of design, but has a smaller case diameter of 36 mm. The Pilot's Watch Chronograph isn't as minimalistic as the Mark XVIII. The 43-mm watch features a stopwatch function as well as three subdials. The small seconds at nine o'clock catches the eye thanks to a small red seconds hand standing out against the black/white color scheme. Its caliber, caliber 79320, is based on the popular Valjoux 7750 movement produced by the world's largest ébauche manufacturer, the ETA SA Manufacture Horlogère Suisse (ETA). One of IWC's series is dedicated to the pilot and writer Antoine de Saint-Exupéry, author of The Little Prince. The Frenchman was presumed dead in 1944 after disappearing during a reconnaissance mission while flying his Lockheed P-38. The series has a distinctive retro touch and the watches stand out with their characteristic blue or brown dial. They all come with a brown calfskin strap. The watches' case backs feature Saint-Exupéry related engravings, such as a P-38 or a portrait of the man himself. The collection also features a split-seconds chronograph. With this chronograph, you can time intervals while continuing to time another event. The Spitfire series pays homage to the most well-known pursuit plane from the Second World War. The case back features an engraving of the plane's silhouette from a bird's eye view. Most Spitfire watches can be identified by a slate gray dial. IWC entered the era of jet planes with their Top Gun series. The name refers to the United States Navy Strike Fighter Tactics Instructor program, more commonly known as Top Gun. Top Gun is also the name of a successful 1986 film starring Tom Cruise. The watches in the Top Gun series all feature a ceramic case, setting them apart from the other pilot's watches. The backside features an engraving of the Top Gun logo. The series also includes variations on other well-known IWC pilot's watches, such as the Big Pilot's Watch Top Gun, based on the Big Pilot. The case, strap, crown, and dial are completely black, while the hands, numerals, and stick indices are white. Do you want an authentic pilot's watch? IWC has been producing pilot's watches for civilian and military use since the 1930s. 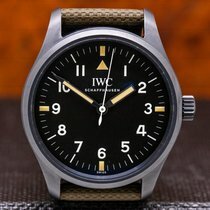 Very few Swiss manufacturers have a connection to aviation like IWC does. Their most significant competitor in this regard is Breitling. If you want to stay trendy with a larger watch, then the 46-mm Big Pilot is a good choice. New versions made of stainless steel cost around 10,000 euros. If you prefer a red gold case, then the Big Pilot from the Spitfire series costs a total of 21,000 euros new. Some of these pilot's watches also offer special complications. The Timezoner Chronograph can display multiple time zones. The Big Pilot's Watch Perpetual Calendar from the Antoine de Saint-Exupéry series has a perpetual calendar and perpetual moon phase display and shows the date, day of the week, month, and year. The Mark XVIII is much less complicated; it features only one complication, a date display. The watch closely resembles the legendary Mark 11 used by the RAF. New, you can buy a simple Mark XVIII for around 3,500 euros. A vintage Mark 11 from the 1950s costs double that. The original Mark 11 had a diameter of 36 mm, but pilot's watches that size have become rare. IWC brought back the standard 36-mm size with their Pilot's Watch Automatic 36. New, it costs between 3,000 and 4,000 euros. IWC was manufacturing watches well before their first pilot's watches were made in 1936. However, they had a bit of a bumpy start. Florentine Ariosto Jones (1841 - 1916), an American, founded the International Watch Company in 1868 in Schaffhausen, Switzerland. Jones wanted to produce watches cheaply in Switzerland and sell them for profit in the United States. However, expensive import taxes prevented this from being a successful business model. After switching owners multiple times and declaring bankruptcy twice, IWC remained in the hands of the Rauschenbach and Homberger families from 1880 to 1978. IWC was heavily affected by the Quartz Crisis and again switched owners. Since 2000, the company has been a part of the Richemont Group along with other luxury brands such as A. Lange & Söhne, Cartier, and Panerai.